Click here to view current Medical/Surgical opportunities. 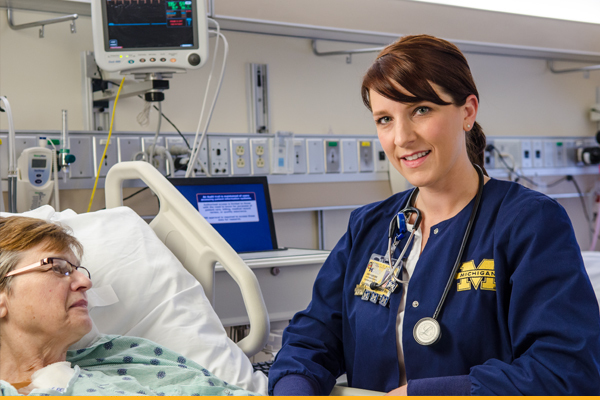 Perhaps no nursing specialty within the University of Michigan Health System better represents the extensive variety of patients we serve, than our Medical/Surgical division. Incredibly versatile, compassionate health care professionals, Medical/Surgical nurses collaborate with physicians, therapists, technicians and other staff members to provide exceptional generalized care to patients of all ages, presenting a comprehensive range of medical conditions. RN’s on the 32-bed unit provide care to patients on the Neurology, Neurology Stroke and Neurosurgery services and includes a six-bed Stroke Unit. The unit cares for patients with the following diagnoses: brain and spinal cord tumors, epilepsy, stroke, cerebral aneurysm, neuropathy, Myasthenia Gravis, and head and spinal cord trauma. 4A staff members believe that the professional nurse provides comprehensive, holistic care to patients and families in collaboration with other members of the health care team. Nursing staff provide a full range of services to patients and families, including assessment, emotional support, education, patient/family advocacy, discharge planning/teaching, health promotion and coordination and collaboration with the health care team. The plan of care is developed based upon assessment data and unit policies/standards. Patient family members/significant others are integral to the patient’s well-being and are included in the service provided to all patients. 4B is a 28-bed adult telemetry step-down unit, specializing in the care of Otolaryngology, Plastic surgery, Maxillofacial surgery, and Minimally Invasive surgery (General Surgery Blue-SGB) patients. We offer an interdisciplinary, collaborative “Team” approach including: Physicians, Registered Nurses, Physicians Assistants, Nurse Practitioners, ICU Technicians, Physical & Occupational Therapists, Speech Pathologists, Registered Dieticians, Discharge Planning & Social Services, and Pharmacy to coordinate patient care from admission to discharge. Our team focuses on intricate care needs, while providing support and teaching to our patients and their family members. Our flexible, compassionate nursing staff go the extra mile to ensure a positive post-operative recovery experience for the patient. A 32-bed unit specializing in orthopaedics and trauma, where nurses provide post-operative care for procedures such as total joint replacements, open reduction internal fixation of fractures and spinal fusions. Our Orthopaedic/Trauma Med./Surg. nursing staff are experts in the care of orthopaedic /trauma patients, post-operative pain management, and discharge education. Nursing care is individualized to each patient and/or family in order to address and meet their personal needs. It is our goal on 5A to provide patient/family centered care which enhances the patient experience and allows for healing to occur in a timely manner. We want our patients to be comfortable and we want to ensure the best outcome for all while using evidence to support our practice. A 32-bed unit that primarily includes patients admitted to the Internal Medicine services of Gastroenterology (GI/Liver) and General Medicine. The interdisciplinary team provides care to patients across the adult life-span who are experiencing acute and chronic episodes of a wide range of illnesses and conditions. Provides care for surgical patients with kidney, pancreas or liver failure, abdominal organ transplants, and disorders of the gastrointestinal or urinary tracts. Common post-operative procedures for our patient population include, but are not limited to: abdominal organ transplants, bariatric surgery, whipples, bowel resections, cystectomies, nephrectomies, and neobladders. We are proud to work in partnership with our physicians, our patients and their family members, and other UMHS staff toward the goal of promoting excellence in every aspect of the health care experience. Provides highly skilled compensatory care to adult patients engaged in rehabilitation, to restore functional capabilities following debilitating illness or incidents. 6A Nurses skillfully balance a desire to empower patient self-management and family involvement with the clinical reality of providing comprehensive rehabilitative care for patients who are sometimes clinically fragile and often very dependent. Our nurses are actively involved in interdisciplinary practice, with collaboration occurring through structured team meetings and extensive care plan development. Patients and families are also members of the team and are encouraged to be involved in systematic discharge planning. Our mission is to promote achievement of health goals, mutually established with our clients, in an atmosphere of openness, honesty, respect and compassion. Provides cutting edge treatment modalities such as IV insulin and labetolol, IVIG and Cytoxan therapy for Lupus. 6B is an Internal Medicine unit offering challenges to not only the new graduate but also the experienced RN. The RN staff work collaboratively with physicians to provide cutting edge treatment modalities such as IV insulin and labetolol, IVIG and Cytoxan therapy for Lupus. The nurses are specialists in End Stage Renal Disease and perform Peritoneal Dialysis on second generation Baxter Cyclers. The staff of 6B is committed to providing quality patient care to patients and families that is holistic, compassionate and acceptance of diversity. This is accomplished through knowledge, collaboration and ongoing professional development in a dynamic, changing environment. A 32-bed unit providing 24-hour nursing care to adult pulmonary patients presenting with compromise of the cardiopulmonary system. 6C is the home floor for the division of Pulmonary and Internal Medicine within the University of Michigan Health System. Pulmonary Medicine patients are typically admitted with problems such as asthma, Wegner’s granuloma, COPD, pleural effusion, pulmonary embolus, pneumothorax, pneumonia, sarcoidosis, and cystic fibrosis. Internal Medicine patients (adult to elderly) are admitted with a variety of diseases, most often presenting with diabetes, renal failure, liver disease, HTN and CHF. Caregivers within 6C subscribe to a holistic approach which places equal emphasis upon the physical, psychological, emotional and cultural needs of the patient and significant others as we strive to assist them in the attainment of self sufficiency and a return to the environment that best meets their needs. 8B is a 32-bed adult telemetry unit, specializing in the care of General Medicine patients. On 8B, you can expect to receive care delivered by an engaged multidisciplinary team in an integrated environment that supports learning, discovery, and continuous improvement. 8C is a dynamic 32 bed unit home to medical and surgical services. The nursing staff of 8C is a team-focused group of diverse and unique individuals that practice total patient care. 8C specializes in the care of General Surgery patients. This includes the Services of : Urology, General Service Endocrine, Surgical Gynecology, Surgical Oncology, Family Medicine, Anesthesia, and Dermatology. Family Medicine diagnoses include a wide range of medical diagnoses including pneumonia, CHF, GI bleeding, COPD and DVT. We are dedicated to quality patient care and world class customer service. The nursing care provided focuses on physical comfort, psychological support for patient/family and educational needs relating to self/continuing care after discharge.